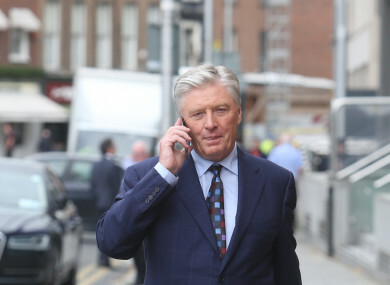 BROADCASTER PAT KENNY has suffered a setback in his battle to prevent a high-density development proceeding on a site adjacent to his Dalkey home. This follows the release of the Council planner’s report which recommended that Dun Laoghaire Rathdown Co Council refuse planning for three apartment blocks and seven houses beside the Kenny home. The application by Richard Barrett’s Bartra Capital Property was refused on a number of grounds and the refusal was mainly concerned with the impact of the height, bulk and scale of two of the apartment blocks on neighbouring properties. However, the planner’s report has given fresh hope to Barrett for a high-density development “for this unique site” adjacent to the Kenny home, The Anchorage. In the 30-page report, the Council planner states that the Council “considers that there is an opportunity to provide a high quality residential development on the subject site”. The planner states that in order to achieve this, “the bulk and mass of the proposed development and its relationship with the directly adjoining sites should be revised to provide a high density, attractive infill development for this unique site”. Earlier in the report, the planner states that the principle of the redevelopment of the site with an appropriately high density residential scheme would be considered acceptable on this site. It stated that the proposed density of 43 units per hectare “is a reasonable density”. The planner’s report also reveals that Bartra had reached a deal with the Council to reserve a portion of the development for social and affordable housing to comply with requirements under Part V of the Planning & Development Act 2000-2015. The report discloses that Bartra proposes to comply with the Part V requirement by the transfer to the Council of two one-bedroom units at a combined indicative cost of €673,078. The report stated that should planning be granted, “the council may review the proposal and seek an alternative mix of unit types to reflect the current housing demand at that time”. In August, Bartra Capital Property paid €3.1m for the Maple Tree House site adjacent to the Kennys’ home and also paid for an additional 0.51 acre site to allow the planning application be lodged last month. The firm will be determined to get a return on its investment and the planner’s report’s observations may persuade the firm to lodge revised plans with the Council rather than appeal the Council’s decision to An Bord Pleanála. The application consists of 19 apartments in three blocks ranging up to four storeys along with five three bedroomed homes and two semi-detached homes on the 1.4 acre site. The comprehensive Kenny objection ran to 16 pages and was signed by Pat Kenny and Kathy Kenny. The Kennys stated that the development will result in gross overlooking along with loss of light and loss of privacy of The Anchorage. They stated that “the Duplex apartments at the end of the site overlook The Anchorage and any roof terrace or window would be less than 15 metres from our daughter’s bedroom window and 19 metres from our bedroom window”. They point out that the ground level of The Anchorage is 3.5 metres below the ground level of the Duplex Apartment block G&H. Email “Pat Kenny suffers setback in planning row after council report gives fresh hope to developer”. Feedback on “Pat Kenny suffers setback in planning row after council report gives fresh hope to developer”.